Huge tyre clearances let you run tyres up to 700 x 43c. And of course, those wheels are held in place with thru axles front and rear for security and easy installation. Gravel specific geometry means you'll maintain stability whatever the road surface, but still be in an optimum position to put the power down and the miles in. The lightweight carbon frameset gives a comfortable ride whatever trail youre on, and has fully capable rack mounts, front and rear mudguard mounts, and a triple set of bottle mounts. Its incredibly capable - this frame can even take 650b x 47c tyres and even a dropper telescopic seat post. It's future proof! Groupset: SRAM Rival 1 HRD is an 11-speed groupset that brings a host of great new features to the party. A single front chainring with 'Narrow-wide' tooth profile ensures chain retention. Add in the extra chain tension that comes from the 'clutch mech' design and you have the best chain security you can ride. SRAMs wide-range cassette to give you the maximum gear options for powering up and down the trails, whilst powerful hydraulic disc brakes give effortless stopping power and great modulation, so you can finesse your braking efforts to suit the surface conditions. Rival 1 brings serious price performance to the all-road market and it makes the perfect gravel bike groupset. Wheelset: Fulcrum's 700 Disc wheels come from the brand that builds Campagnolo's wheels - there are few higher recommendations than that! Tough 700c rims are paired with adjustable cartridge bearing hubs and are laced to asymmetric rims for extra strength while keeping minimum weight. Featuring the improved DRP seal kit for extra longevity. The Space Chicken Gravel Bike is the perfect blend of all the best bits of every other bike category. It's far more comfortable than a road bike and geared for tackling off-road trails and comes with all the mounts you'd expect on a real tourer. Sourced and built exclusively for us here at Planet X, we offer the best value for money as we're cutting out the middleman and dealing directly with you. 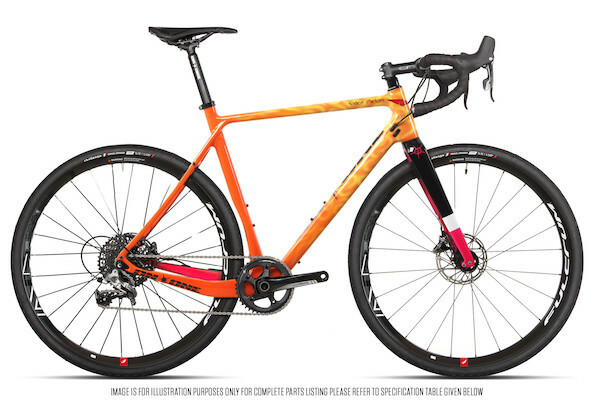 Upgrades: We offer a great stock build, but also offer quality upgrades - we're going to build this bike for you, so offer you a wide range of options. Don't miss out on the chance to upgrade and get an even better - and unique - model. Please Note: All customisable options will be fitted by our trained mechanics. Flamed Grilled paint option is a £100 upcharge due to complexity. Pre order Bikes showing as in stock we aim to build on Thursday 24th of April. Add to basket Bikes showing as in stock we aim to build on Thursday 24th of April. First choose your size, colour and quantity. If you're happy with the standard build, click 'Add To Basket'. We also offer customisation options, so if you 'd like to make any changes click on 'Customise' to get this started.